The setup for monitoring solar flare activity is made up of four basic building blocks and a computer to record data. 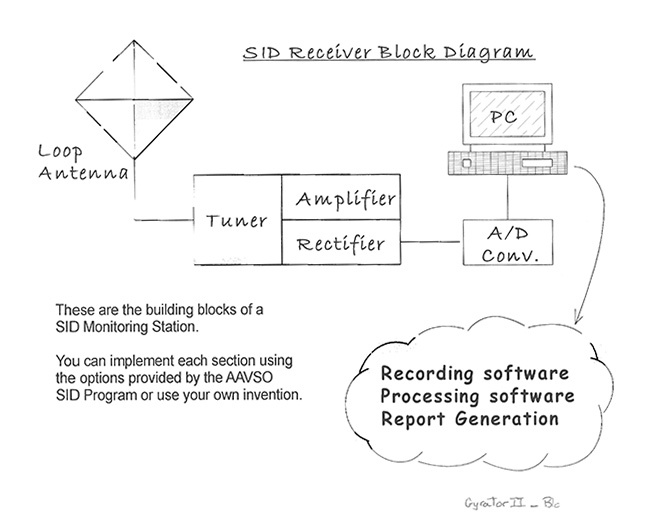 The ANTENNA most commonly used for SID monitoring is a small Loop Antenna that consists of many turns of small gauge wire wound on a square frame a little larger than the size of a dinner plate. The antenna, acting as an inductor, is tuned with a capacitor sufficient to cause the loop to resonate at the frequency of the station being monitored. The TUNER, much like the antenna, must be tuned to the appropriate frequency based on which station you are monitoring. The AMPLIFIER is used to boost the strength of the signal so that it can be converted to a Direct Current signal and recorded. The ANALOG to DIGITAL CONVERTER (A/D)is a separate device from the receiver which converts the continuous voltage quantity to a discrete time and digital number, which can be graphed on the computer. For folks who use a data logging device from DATAQ Instruments, Data Acquisition Starter Kits can be found here: (these have a USB interface for their data acquisition unit.) http://www.dataq.com/data-acquisition-starter-kits/data-acquisition-starter-kits.htm You can use the software provided by DATAQ to log data but must take the format into consideration for processing recording the start, maximum and end times for SIDs. For folks who use a soundcard there is easy to use software on this web site: http://www.radiosky.com/skypipeishere.htmlthis also requires consideration of data format for report generation. I would recommend the Gyrator III as an easy to build receiver. 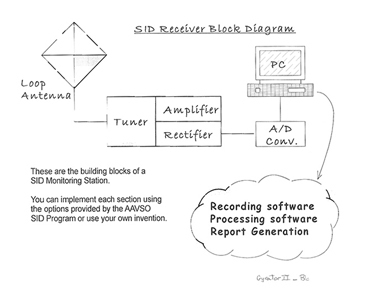 http://www.aavso.org/gyrator-iii-vlf-receiver (This document has instructions on the Antenna, Tuner and Amplifier). The Gyrator III was originally designed by Art Stokes for the AAVSO SID program and eliminates an inductor in the input tuning circuit by using a couple of Op-Amps in what is known as a Gyrator configuration. This design is based on inductor based receivers, used by past SID Observers, and is similar to the Gyrator I and II. There is also what is known as a minimal Gyrator circuit which was an attempt to make the circuit as simplistic as possible and hence cheaper, (see SID Equipment). See other hardware options by going to the SID Equipment section of the AAVSO web site (see below).